A group within the All Progressives Congress (APC) in the South-West, Progressives Mandate has berated the Ogun State Governor, Ibikunle Amosun, over his attack on the National Leader of the party, Senator Bola Tinubu. A statement issued on Wednesday by the coordinator of the group, Hon. Biyi Akintayo, stated that Amosun’s outburst against Tinubu and a former governor of Ogun State, Segun Osoba, was unwarranted. On Monday, Amosun while swearing in Mosunmola Dipeolu, Chief Judge of the state, at the government house, Abeokuta, the state capital wondered why Tinubu and Osoba, were silent on the controversy trailing the Ogun governorship primary. Amosun accused the leadership of the party of forging results of the primary election in Lagos. “He (the president) knows that they just went to Lagos, write all results, and that what they did is fraud. If the national working committee or the national chairman said there was any election in Ogun state, it was all fraud,” Amosun said. “The issue of Chief Osoba and Asiwaju and co, what we said was that there was a deafening silence from their end, and silence means consent. But according to the group, accusing the top cheiftains of perpetrating fraud in the emergence of Prince Dapo Abiodun as APC governorship candidate in Ogun State, despite the endorsement by the National Working Committee (NWC), was unfortunate. The statement read: “How could Amosun accuse Osoba and Tinubu of electoral fraud? Has Amosun suddenly forgotten that these were the duo that worked for his emergence in 2011? “As new decampees into the now defunct ACN, Sen. Ibikunle Amosun and Hon. Abiodun Isiaq Akinlade were the stars of the party in the build up to the 2011 polls. “We recall that seven other aspirants at that time decided to select a candidate. At a meeting held at Ikeja and chaired by Aare Remi Bakare with the likes of Dr. Kayode Soyinka, Prince Kayode Tejuoso, Mr. Temitope Kuyebi, Gbenga Obadara and Hon. Akinlade among others in attendance, Akinlade emerged and his name was to be forwarded to the leadership of the party the following week. “Shockingly, before his name could be officially communicated, a meeting was summoned by Osoba, the leader of state chapter, at an hotel in Abeokuta GRA, close to Amosun’s residence. “With the then chairman of the ACN, Alh. 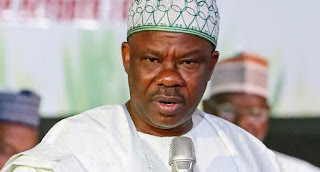 Tajudeen Bello and late Baba Adeniji presiding over the meeting alongside the Abuja stakeholders, Amosun, was to the chagrin of other aspirants announced as the choice of the party hierarchy. After all the hues and cries, the other aggrieved aspirants agreed with the decision and moved on. “Just about a week after the name of Sen. Amosun had been forwarded to INEC as ACN candidate, Amosun left for CPC, but swiftly showed up when the guber ticket had been conceded to Hon. Akinlade to beat the electoral body’s submission deadline. “After pleading with the same Asiwaju Tinubu that he is deriding today, Baba Osoba was prevailed upon to forgive Amosun and the rest is history. “In sum, it is on record that Osoba and Tinubu were conspicuously instrumental to his emergence as the Governor of Ogun state. For the records, all these happened without Amosun going through any election. The question begging for answer is, has Amosun forgotten so soon? “One is not unaware of how Amosun begged his way to the Oke Mosan Governor’s office in 2011; he was even at the Owode-Yewa residence of Hon. Abiodun Akinlade to commend him for conceding the ticket to him in the build-up of the 2011 polls. “For Amosun to call on these duo agent of fraud as regards their silence on the emergence of Dapo Abiodun as APC candidate for 2019 polls, leaves more to desire especially for the discerning minds in Ogun State,” the statement said.